I make lemon curd on a regular basis when I have a few extra lemons on hand in my kitchen. The velvety curd is packed with luscious lemon flavor and is surprisingly easy to make (you can even make it in the microwave!!!). When you have a freshly made batch, you can serve it up with scones, spread it onto waffles or eat it with a spoon. You can also use some to make this Lemon Curd Swirl Quick Bread, a lemony loaf cake that has a lemon curd swirl running through every slice. 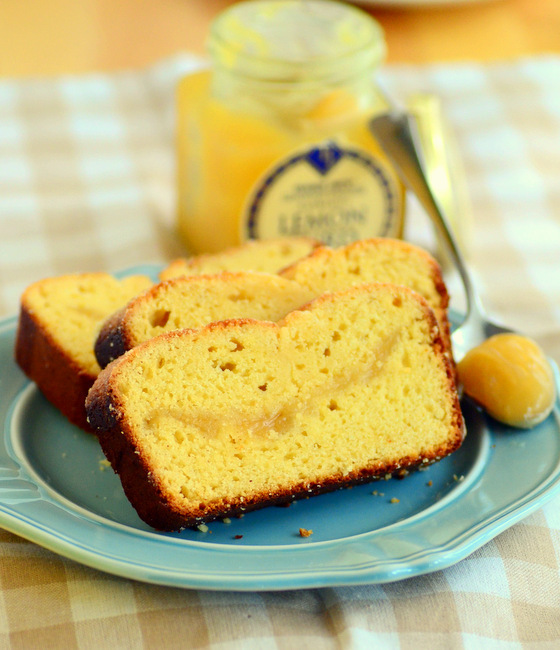 The cake itself is good even without the lemon curd, but it turns into something very memorable when you amp up the lemon flavor with the swirl. IT is a simple sweet bread that is made with buttermilk, lemon juice and lemon zest. The juice and zest of the lemon give it a nice lemony base, while the buttermilk enriches and tenderizes the loaf to give it a moist, soft crumb. You can use homemade lemon curd for this bread or store-bought lemon curd, as both will give you good results. The look of the swirl will be slightly different based on the curd you use – some curds are a bit thinner and others are very thick – but they will all be delicious! Once you’ve made the batter, spoon half of it into a lightly greased loaf pan. I like to line the pan with parchment paper just to ensure that any lemon curd that sneaks out of the loaf doesn’t stick to the pan, but it’s not usually necessary. Next, spoon the lemon curd into a roughly even layer on top of the batter, then spoon on the remaining batter and spread it into an even layer to cover the exposed curd. Take a butter knife and gently run it through the batter, creating a slight swirl in the loaf. Once the swirling is finished, the bread is ready to bake! It can be slightly difficult to gauge the doneness of this bread because you can’t always do a toothpick test (lemon curd will stick to the toothpick. Instead, check by lightly pressing on the top of the loaf and looking for it to spring back. The outside of the loaf will also be golden brown when the bread is done. Allow the bread to cool completely before removing it from the pan and slicing it. The loaf will keep for several days in an airtight container. Preheat oven to 350F. Lightly grease a 9×5-inch loaf pan and line the bottom with parchment paper. In a medium bowl, whisk together lemon zest, egg, vegetable oil, lemon juice and buttermilk. Add mixture to the dry ingredients and stir until just combined. Spoon half of the batter into the prepared pan and spread into an even layer. Spoon lemon curd on top in small dollops and use a spatula to gently spread into an even layer. Pour remaining batter on top of the lemon curd and spread evenly. Insert a butter knife into the batter and use to gently swirl the curd into the batter. Bake for 50-55 minutes, or until bread is golden around the edges and the top springs back when lightly pressed. Allow bread to cool before removing from the pan.